Available in two finishes - traditional mirrored stainless or brushed stainless. The elegant Frieling French Press coffeemakers eliminate costly and time-consuming replacements of fragile glass beakers. These are immaculately crafted, as visually stunning as they are functional. They are double walled stainless steel, providing excellent insulation to keep your coffee warm. Four sizes are available. These can be used for coffee or tea, and may be used for hot or cold serving. 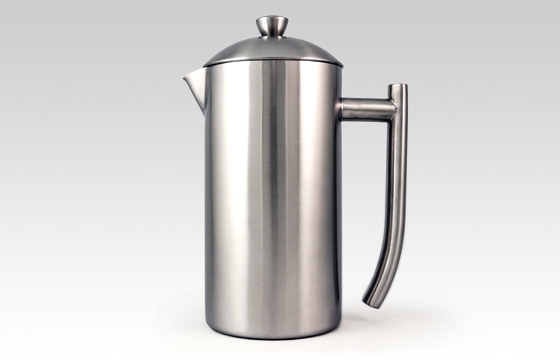 Vacuum Insulated Carafe Style Stainless Steel French Press 18/10 stainless steel with mirror finish or brushed finish on the outside, and a brushed finish inside. All stainless mesh plunger mechanism.